Well, well, well... Am I in a terrible mood now. First, I offend all of you by not releasing pictures last week of Ben & Jerry's new product line (currently being introduced in NYC as we speak). 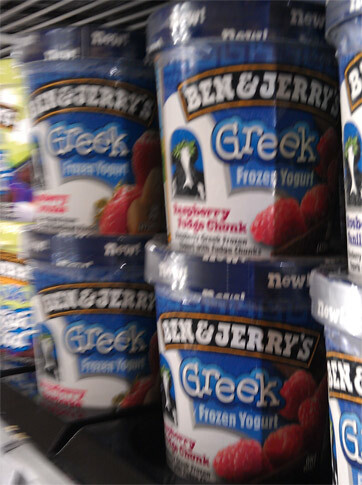 In classic karmic retribution for putting corporations in front of fans, my special greekin' delivery ain't showing up. I swear, I felt guilty last week for being a jerk and now I've willed the universe to give me some payback. Oh well, ignore me, let's check out the big announcement. When I blurred that shot last week, I didn't have to add much blur to the original. What you see before you is Raspberry Fudge Chunk (which I bought) and Strawberry Shortcake (as reviewed by junk food guy). RFC is Raspberry Greek froyo with Fudge Chunks. SS is strawberry greek froyo with shortbread pieces. The other two new flavors are Banana Peanut Butter and Blueberry Vanilla Graham. BPB is Banana Greek Froyo with Peanut Buttery Swirls. 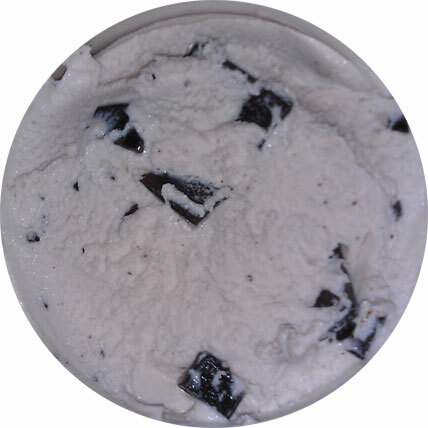 BVG is Blueberry and Vanilla Greek Froyo with a Graham Cracker Swirl. One of them sounds excellent, the other one has banana in it. These are the only four flavors I found so I'm pretty shocked that one of them is banana flavored. I've never seen banana froyo in the grocery store. Sure they are trying to be different, but... iunno, I guess they wanted to mix the peanut butter swirl with something other than chocolate. Sweet Eureka! Look, I got the invite last week for the big event today and let's just say I wasn't surprised when I discovered these pints the next day. I mean with a catch phrase like "It's really greekin' good", what else could it have possibly been? 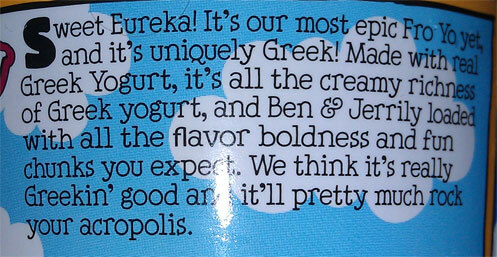 Oh, and as an aside, don't forget that on February 12th, I called out that 2012 would be the year of Greek Froyo (and that was before I knew what B&J was up to). I'm a sucker for Raspberry so that's why I picked it first. but at $5.49 a pint, I wasn't willing to take the risk. Sorry, the pint was pretty soft so this isn't the best shot. The Stop & Shop employee took way too long stocking these. Oh well. 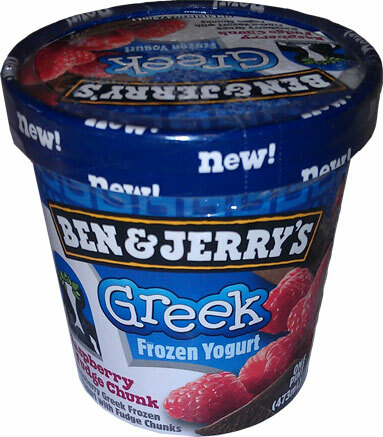 I think it's pretty obvious that this pint is jam packed with chunks. You know what hit me first about this pint? The smell. Where the might B&J froyo had no hint of the fact it was yogurt, this is undeniably yogurt. It's not super tart, but it's a distinct yogurt taste, smell, and even aftertaste. Now before we get too far, you are probably going to hear how awesome this stuff is and creamy and this and that and all that. Yeah, with one pint behind me, I ain't jumping on that bandwagon just yet. Thing is, I now why you'll see glowing reviews. Heck, this pint even tricked my wife... actually, she probably thought I was a little crazy for not liking it off the bat. See, when I first went in, I was scooping just the base and getting hit with all the yogurt flavor. My wife on the other hand went straight for the chocolate. There are so many chunks in here that if you scoop right, you keep a nice coating of chocolate on your taste buds and the yogurt-ness doesn't take as strong a hold. No, it's not terrible. You all know I despise tart yogurt, so the fact I took more than a few bites is encouraging. I had two separate tastings before handing this one over to my wife who made short work of what was left. That said, I'm still really shocked that there's any yogurt tartness at all. Yes, it's creamy, I won't argue that either. I just don't really like this. As someone will inevitably say "hey, that means more for me". Yes, more for you, enjoy. 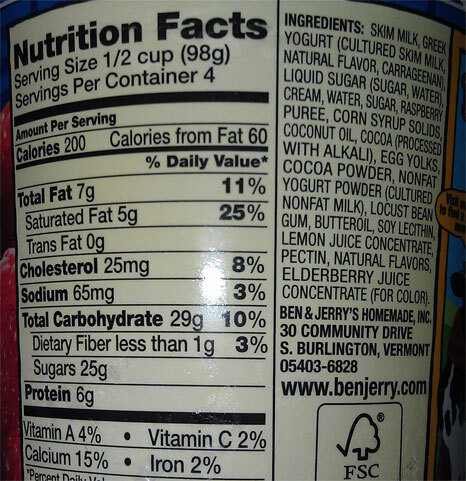 Here's the ingredient list if you are curious. Skim Milk, Greek Yogurt, Sugar, etc etc etc. Let me say right now that I will never put you guys second when it comes to early releases. If I haven't signed an NDA, then I am blabbing whatever I feel like. I denied you, I denied myself, and it won't happen again. I'm glad that they left the tartness of yogurt in. Afterall, that is what makes yogurt, yogurt. Not all people like true yogurt and that's fine, they should stick with ice cream. Last week just built up the suspense for us; so don't even worry about it! I would have expected this to be a little tastier with that amount of calories; fat and sugar. I don't really eat regular yogurt or anything, but I do know that plain, unflavored Greek Yogurt is exceptionally thick and tangy, to the point that is often used as a sour cream substitute. I suspect that might have something to do with the taste, although I can't say for sure as I don't ever buy any of the flavored varieties. Peanut Butter Banana is the only one that has my interest somewhat. It's the closest thing I've got to them bringing back Monkey Wrench (Chunky Monkey and PB Cup swirled together), so I will probably give that one a shot. As for the others, I will probably stick to the standard Froyo. Yeah, I just don't do tang, never have, never will. The tang is not crazy here, just wasnt expecting it, seems so non-B&Js. Monkey Wrench? Interesting. If you try the BPB, let us know. I personally love their Half Baked & Chocolate Fudge brownie Fro-yo because it is lighter than ice cream but still resembles it. What's the point of eating this Greek fro-yo crap if it has just as many calories but not the same satisfaction as eating cookie dough and brownie chunks? I found the Banana Peanut Butter froyo at Shop Rite today. I will review it tomorrow night and let you know! OMG Dubba you need to start liking banana ASAP! 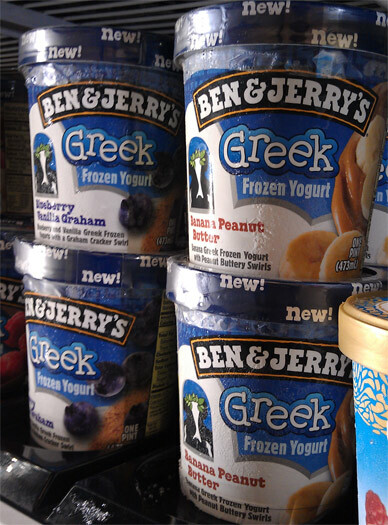 First off, I don't even like yogurt, Greek or otherwise. But I do like bananas and peanut butter swirls so I figured I'd give this one a shot. The first thing I noticed is how soft the ice cream is, mainly because it's a froyo. The base tastes like pureed banana, clean and mild. The swirl itself also wasn't too sweet, like a healthy peanut butter. Together it was addicting, and once again more than half the container went down too easy. I'd definatly buy this again, 9/10 for sure! that shortcake strawberry flavor is so good, better than most of the ice cream flavors! with a fraction of the fat content! Have to agree with Danielle. The PB & Banana is out-of-this-world delicious. I put down the entire pint in a single sitting... couldn't help myself. I really enjoyed the Banana peanut butter, but this raspberry one has a distinct chalk-like taste. I'm undecided.